Violently harassed by freemasonry at UF Health for being a whistleblower. See my Quora, Facebook, and LinkedIn. 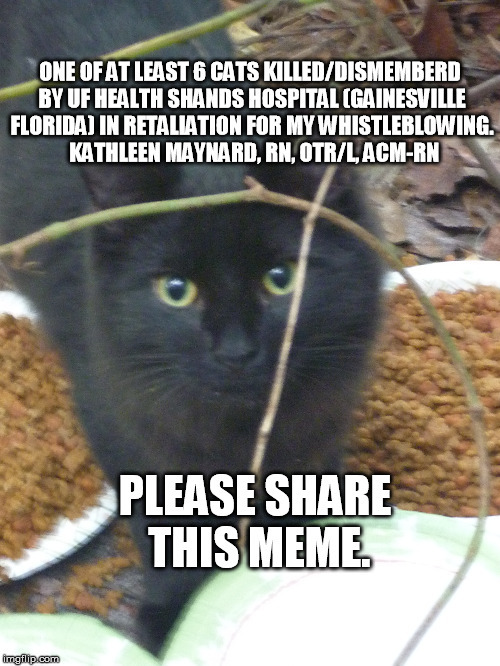 ONE OF AT LEAST 6 CATS KILLED/DISMEMBERD BY UF HEALTH SHANDS HOSPITAL (GAINESVILLE FLORIDA) IN RETALIATION FOR MY WHISTLEBLOWING. KATHLEEN MAYNARD, RN, OTR/L, ACM-RN; PLEASE SHARE THIS MEME.